Jayalalithaa was sworn in today as the CM of Tamil Nadu for the fifth time at the University of Madras. AIADMK supremo J Jayalalithaa today was sworn into power nearly eight months after she was forced to quit over corruption charges. Jayalalithaa took the oath in the name of God in Tamil in a simple function held at the University of Madras Centenary Auditorium here. Twenty-eight other ministers also took oath in a brief ceremony. The 67-year-old AIADMK supremo was administered oath of office and secrecy by Governor K Rosaiah. 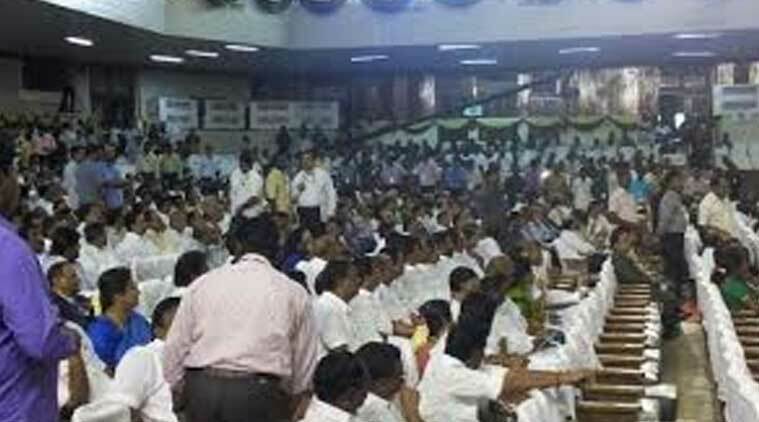 The swearing-in ceremony was attended by BJP leaders including Union Minister Pon Radhakrishnan and national office bearer of the party H Raja. Jayalalithaa was disqualified following her conviction in the Rs 66.66 crore disproportionate assets case by a trial court in Bengaluru on September 27. The Karnataka High Court had subsequently acquitted her of the charges on May 11. Jayalalithaa was seen smiling and having a brief conversation with Governor Rosaiah. Several representatives from the tinsel world were also present at the ceremony. The entire oath taking ceremony, including signing of documents and other formalities, was over in less than 30 minutes. On her way to the Madras University Centenary Auditorium, Jayalalithaa was greeted by party workers and supporters who gathered on either side of the road. As for portfolio allocations, Jayalalithaa’s trusted lieutenant O Panneerselvam has been given Finance and Public works, which he held previously too. Natham R Viswanathan will continue to hold electricity, prohibition and excise portfolio. R Vaithilingam will be the Housing and Urban Development Minister while S Gokula Indira will head Handlooms and Textiles ministry. B Valarmathi will be the Social Welfare Minister and Edappadi K Palaniswami the Minister for Highways and Minor Ports and Forests. The portfolio of forests was held by MSM Anandan previously in Panneerselvam Cabinet. Other ministers sworn in include P Mohan (Rural industries), P Palaniappan (Higher Education) Sellur K Raju (Cooperation), R Kamaraj (Food and HR and CE), P Thangamani (Industries), V Senthil Balaji (Transport) M C Sampath (Commercial Taxes), S P Velumani (Municipal Administration, Rural Development, Law, Courts and Prison) and TKM Chinnayya (Animal Husbandry). S Sundararaj (Sports), SP Shunmuganathan (Tourism), N Subramanian (Adi Dravidar and Tribal Welfare), K A Jayapal (Fisheries), Mukkur N Subramanian (Information Technology), K T Rajenthra Bhalaji (Information and Special Programmes Implementation), B V Ramanaa (Milk and Dairy), K C Veeramani (School Education), Thoppu ND Venkatachalam (Environment), TP Poonachi (Khadi), S Abdul Rahim (Backward Classes and Minorities Welfare) and D C Vijayabaskar (Health) are the other ministers. 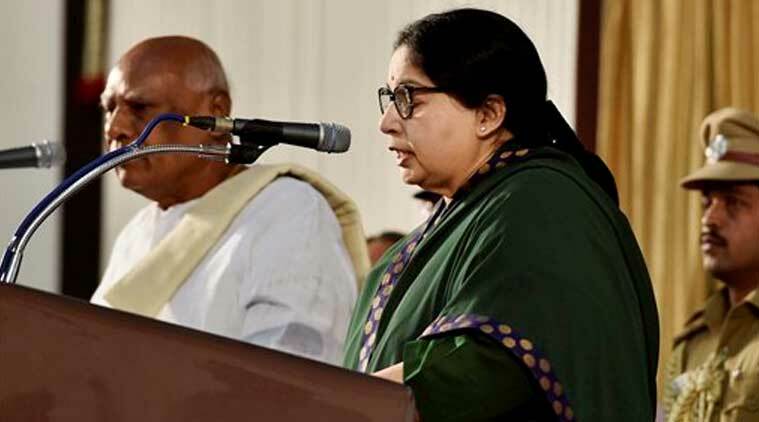 After Jayalalithaa took oath, the 28 other ministers were jointly sworn in by the governor. 11:24 am: The programme concludes with the national anthem. 11: 15 am: One by one, the ministers in the cabinet are taking oath. 11:08 am: Amidst a packed audience, J Jayalalithaa takes oath as the chief minister of Tamil Nadu. 11:06 am: The venue is packed with over 5,000 people. 11:05 am: The National anthem is being played now. 11:03 am: Governor K Rosiah arrives for the function. 11: 00 am: J Jayalalithaa arrives at Madras University for the swearing-in function. 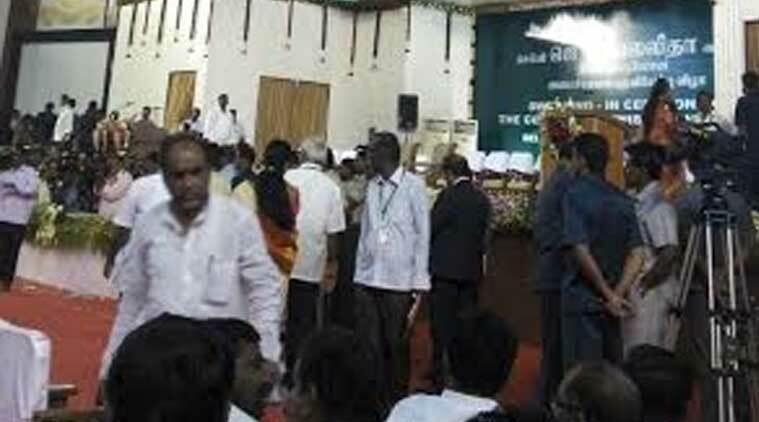 10:45 am: Prominent BJP leaders including MP Pon Radhakrishnan are in attendance at the hall. 10:35 am: This is the centenary hall of the University of Madras.